FACT : In the eight year history of auspOp, we’ve not once chatted to Australian pop darling Delta Goodrem. It’s been one heck of a glaring omission from the pages of your favourite pop website. But today, all that changes. In our wide ranging Pop Chat, Ms Goodrem talks about her new single ‘Dear Life’, the chase for her next number one, her 15 year anniversary in the recorded music business, her new album – and forthcoming tour. We can’t believe that we’ve been running this little pop oracle for eight long years, Ms Goodrem, and we’ve never nattered to you! Not once! The time has come!! The time is meant to be now! You’re absolutely right! Congratulations on the release of ‘Dear Life’! Are you excited? But it’s not just another in the series though… this must be a special one to you? Of course, of course. I just mean that it’s one of those feelings of you sending them out to the world. This song is the second single off the new album and it feels like my heart’s on my sleeve with it. I feel there’s clarity, it’s positive, it’s reflective, but it’s clear. It’s simple in its messaging, but it’s deep and it’s truth, I guess. It’s a complete stylistic departure from ‘Wings’. Is this a purposeful ploy to keep us a little confused as to what the contents of album number five might be? I don’t feel that it’s confusing at all. I feel like it’s true to what I do. And I feel like ‘Wings’ is that as well. The three of us that wrote ‘Wings’ are the three of us who wrote ‘Dear Life’, so it still feels very much ‘what I do’ and it’s in alignment to what the album is. I’ve always had a core value system in my songs and what I like to talk about, come up with, write… and I feel like it’s just happened to be a bit more of a ballad. A lot of people seem to be saying that it reminds them of even when they first got introduced to my music, so that’s been a really interesting conversation. But no, the album feels great! It’s all happening. It’s all coming together! We’ll talk about that fifth album of yours shortly, but we did want to bring up the fact that 2016 marks the 15 year anniversary of your first release. Can you believe it? Fifteen years? What do you put your longevity in the business down to? Erm… I think knowing who I am as an artist and knowing what I represent with music and what I stand for. I don’t think you can write a song without having something to say and I am honoured that people have had my songs for that long in their lives and that it’s been certain peoples’ soundtracks to their lives as it is mine. It’s a beautiful connection. And will we get a fifteenth anniversary edition of ‘I Don’t Care’ to celebrate? (laughs) It’s not a bad idea… I like your thinking! You know what I would say as well though, when it comes to fifteen years… I work hard, you know? You’ve got to put in the hours. You’ve got to be disciplined. You’ve got to work, you know? I work for my position. I put in time to my craft. But yes, a fifteen year anniversary edition of ‘I Don’t Care’… I’m totally down for it. I’m thinking an acoustic version, even… keeping it real… (sings ‘I Don’t Care’ chorus). Oh you still remember it! Hilarious! So let’s talk about your time on ‘The Voice’. What originally prompted you to say ‘yes’ to being one of the coaches? Gosh, the first conversations I had about being a coach on ‘The Voice’ were obviously five years ago now, but I remember first being approached and I said, ‘no, no… I’m probably a bit more shoes off at my piano – I want everybody’s dreams to come true’. I think that’s pretty much what my response was. And they said, ‘no, no, no… we’re really going to make this something special and it’s going to be huge in Australia’. So I said, ‘okay, tell me more’. And when they explained that I was going to be like a coach – like a football coach – and you build a team… being a really sporty girl, I thought, ‘I get it… this sounds kinda of incredible’. And I took a chance by saying yes and it paid off, because it’s a wonderful show where I learn a lot about the artists and it’s been life-changing for me as well in the sense that I’ve learnt a lot about myself as an artist too. Both ways you learn a lot on the show. That was literally going to be our next question… what has ‘The Voice’ taught YOU as an artist. Some of these performers coming through the competition have done the hard yards like yourself… backing vocalists, gigging for years, but do you think that some of the young people in particular are a little bit blindsided by the thought of an easy road to fame? That’s a really interesting topic to discuss. There’s definitely a new gen where they think, ‘well you guys are gonna do it all, right?’ and we say ‘Yes. In the context of this workshop, yes. But you have to come up with the vision. Tell me your vision. What do you see when you go to sleep at night? What do you imagine that this is meant to play out like? What do you stand for? What do you want to sing about? Who do you want to sing to?’. I remember when I first got signed that I had a book and I would ask people questions, because I wasn’t on anybody’s radar. And I’d ask questions like, ‘so… how do they pick songs at radio?’ and ‘What makes the song do this?’. I just had a notebook and I’d write down everything when I was first signed. And I find it interesting that there’s definitely a new group. But I really work hard at telling my artists that I’m here to be a catalyst to collaborate with them and I want to hear what they want to do… what they imagine. I can facilitate that if they have a vision. They’re in the best workshops in this country. And the place that I learn from is that I see things as an artist and say, ‘you don’t get this’. And I’ll look at another artist and think, ‘I wish I could have been better at this, so I’m going to tell you what you need to do’. I have that real instinct where I want to share and help them so much. I want them to learn from anything I might not have got right and learn from the things I did get right, you know? Are you glad that you didn’t have to go through that whole reality TV singing competition machine yourself? See, this is the part about this era… There’s a lot more of these shows and the accessibility to new music and YouTube and… again, our show really works hard at finding the amazing pros around our country, which is why I get quite protective when it comes to each artist that comes through. Because I know that they’ve been working hard in our industry and I respect all the work they’ve done prior to being on our show. And our show is an incredible platform. But it was a different era in my day. I was still collecting CDs and making scrapbooks. ‘Innocent Eyes’ came out before iTunes came out. It’s such a different world these days. We were chatting to (auspOp writer) Brad about how amazing the days were when you could collect the physical product from all over the world and how there used to be so many different versions to collect. You know what’s been interesting though, is that we’ve still had a lot of physical sales! I’ve found that quite interesting. I don’t know whether it’s a collectors thing, but even now, I always do a physical release through JB Hifis and Sanity stores, who’ve been incredible supporters. Even now, it’s been amazing with the pre-orders, because they keep selling out, so there’s a real collectors’ aspect surrounding the CD still. So let’s talk ‘Dear Life’. What are your hopes for the track commercially? Tenth number one, maybe? That’d be nice! That would be lovely! (laughs) I guess I only hope that people find it in their heart that they connect to it and that it serves them in what they want to express in the moment. It’s a really exciting week, having the song out and it’ll be great to see people connect to it. That’s all. Now… album. We’re going to talk album. It’s been almost four years since ‘Child Of The Universe’… you’ve started giving us little hints, little tid-bits of information on your socials… What can you tell us? I feel like the album is what I do, but it’s evolved, obviously. Well hopefully, not obviously (laughs). Hopefully! It’s got a lot of light and shade, it’s got up tempos, it’s got ballads, it’s got a very rounded feeling about it and songs that you can really sing along with. The DNA boys. And I worked a lot with Dave Hodges and I’ve worked with, obviously, Vince Pizzinga, my long-running collaborator. He and I have done some really big orchestrations in there too, which was so fun. I wrote with Martin Johnson – he was fantastic. Who else have we worked with? I’m going through the set list. There are a couple of songs prior to ‘Wings’ and then there are songs after ‘Wings’. So it’s kind of making sure that there’s that ribbon between them all. That’s always been my job, obviously. Though you can write with all kinds of different people, you’ve still got to make sure you’ve got your distinct sound through it. Absolutely. Glad to hear that Vince is still involved! I hope he’s not getting his nose out of joint with you writing with other people these days…? Oh no! Not at all. He’s my kindred for life. He’s never going anywhere for life. I can write with all different people and we can still know that we’ll continue to live musical lives together. Naww… That’s so sweet! Well we’re presuming that an announcement for this album can’t be too far away? It is literally around the corner. I’m just giving some air to this song and then, obviously, heading on the road… I’ll tour the album straight out the gate so I can share the stories from it really soon. So tour… Tell us about the tour. I think it looks like August. We’re just trying to come up with the dates at the moment, but I think it looks like August. That the album will be before that! So hang on… you’re saying that within the next 12 weeks, we will have a new Delta Goodrem album to call our own! Yyyesss…. (laughs) You leave me enough time and I’ll just keep working on it, so I think I’m getting the door slowly shut. ‘Delta… give us the album NOW’! Well you do leave it a little while between albums, let’s not deny it. You know what? I think that everything in good time. It doesn’t always need to be… I’ve gone off and explored musical theatre, I’ve gone off and explored other elements of music. I continue to work on shows. It’s always meant to happen in good time. Just like our interview! These things are always meant to happen when they’re meant to happen. There’s no need for me to constantly have an influx of new music all the time and I never go out of the gate without feeling 100% that I’m behind the product. One final question, given that you are part of the Sony stable and you DID write the song for this year’s junior entry… Have you ever been asked to do Eurovision? No! I don’t think I’m actually eligible? I’ve really been enjoying watching and barracking for Australia. I’m so happy that I get to perform and do my thing all around the world, but I’m more than happy to be just waving the flag and cheering Dami this year. And I was cheering ultra-loud for Guy last year too. I don’t think I’m eligible, honestly. I don’t think I am. Maybe I am? Why would you not be eligible? Would you do it if you were asked by Sony, though? Say next year, if we make it back to the competition? Look, I’m always open to everything in life, so it all depends (laughs). Like I said, I’m more than happy being on the couch for this one. I love watching it though. It’s good fun. It’s SO much fun. And Dami will absolutely slay it this week. She is incredible. She will slay it. She’s perfect for it. I’m pretty excited to hear how it all goes. Well good luck with the single, thankyou so much for the chat. And hopefully we can chat again when the album drops. Oh we must! Now that we’ve started this new line of conversation, we must have this next chat! 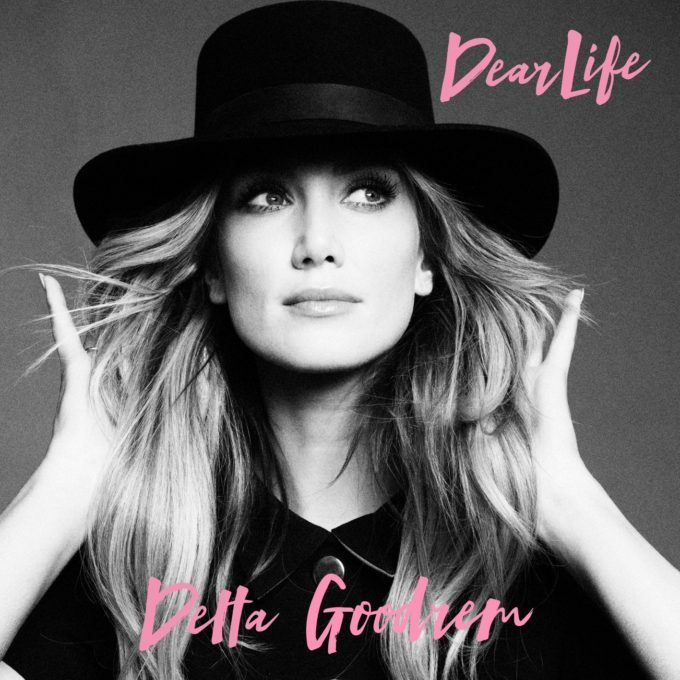 Delta Goodrem’s new single ‘Dear Life’ is available now. Look for details of her fifth album – and tour – dropping soon! Hi Delta, congrats on your amazing new single, very meaningful as my just turned 18 year old daughter has just started treatment for Hodgkin’s, would love for her to receive a reassuring msg from you, would mean so much ? Great to read this. Thanks. Brilliant interview! Super awesome that you got all the goss too. I’ve only seen her supporting for Ricky so I hope she brings the new show to Perth as well.